It has been a difficult few days, emotionally. With the passing of my mom on Sunday (which I wrote about here,) and the aftermath that follows, it's been hard to stay focused on much. I began reading this novel, Passenger, by Alexandra Bracken, on June 30th, and finished it the evening of the 4th. I immediately attempted to purchase the sequel, Wayfarer, only to discover it is not released until January 3rd. So, now I have a book hangover to deal with. For some reason I kept confusing this novel in my mind with Salt to the Sea, by Ruta Sepetys, I think because of the similar coloring on the covers. I still have Salt to the Sea on my wishlist, so I can't yet comment on subject matter. I digress. I really loved this books, and Bracken had be sucked in almost right away. The character of Etta is fierce, and bold, and driven. All things I love to see in strong female lead characters. I must not have read the dust jacket description, or if I did, I must have forgotten, because much of this novel took me by surprise. This story has everything: action, adventure, music, a charming love story, and even time travel. Yes, time travel! 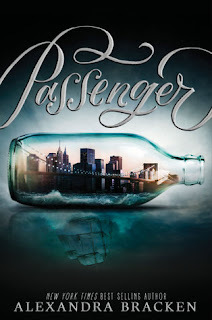 I love time travel, and similar to some of the moral dilemmas that exist in The Chronos Files series, Passenger takes on what it means to be a "traveler," and the impact and ripples that can be caused by tampering with a timeline. While it doesn't have a hard hitting science aspect, I didn't miss it. I was so disappointed to reach the end of the novel and realize I would have to wait six months for the next installation. If you are looking for something delightful, and heartfelt, as well as exciting, this is the book to pick up.